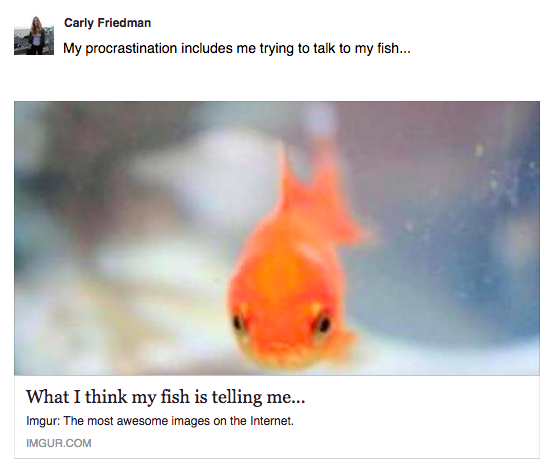 Viral Content Challenge: What my fish is telling me. My goal for this viral content challenge campaign was to increase the reach on my meme and gain as many impressions as I could. With my goal of gaining impressions, I tried to gain some engagement through likes, retweets, comments, or points on Imgur. On this tweet I received 2,601 promoted impressions and 1,745 organic impressions. If I could go back and re-do my viral content campaign I would focus more of my campaign around the weekends. As I could see through ads manager on Twitter, the majority of my impressions took place on Saturday and Sunday, so I would focus my money at those times to gain even more impressions. I would also focus my personal tweets on the weekends too and try to find more prominent hashtags to relate and use with the meme since my personal tweets did not get that much engagement (ranged from 90-170 views). My meme did very well on Imgur and got about 500 views in the first hour of posting it, along with a comment that was very engaging; they added/created a meme that matched the fish theme. When making my ad, I focused in on people on Twitter who follow or look at memes. This seemed to be successful due to the large amount of impressions I received. If I were to do this project again I might post more on other social media sites such as Tumblr or Reddit because those sites tend to have a large base of meme followers. Overall, my viral content challenge ended very successfully. I currently have 594 views on Imgur, 8 points, and two comments. I posted this tweet when the hashtag #280characters was trending to bring in more impressions and views. I used this post both as a tweet and Facebook post to help bring it across platforms and gain more reach. I tried to think of fun/famous phrases that would bring a fun tone to the post that would make people interested. 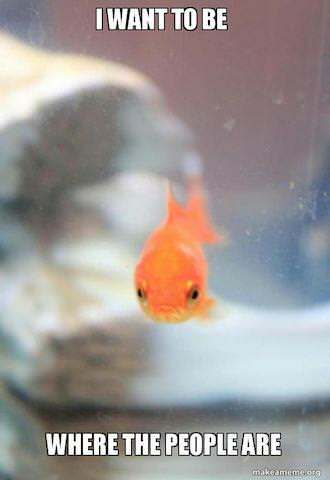 Haha I absolutely love this fish. The meme in itself is already great, but your social media captions made it that much better. Haha I love this! I like your twitter captions, great use of space, along with the funny “I don’t need 280 characters.” Personal favorite; fish are friends not food. Wow, this is great! I don’t remember seeing this when we shared our memes in class, but it definitely would have gotten a first-go-around sticker from me. I never realized fish in their bowl look like, as if they want to get out where the people are.